Listen to "Jupiter's Travel" on your iOS and Android device. On October 6, 1973 Ted Simon knew there was no going back. He loaded up his 500cc Triumph Tiger in the pouring rain and said goodbye to London. Over four years he rode 64,000 miles round the world. Breakdowns, revolutions, war, a spell in prison and a Californian commune were all part of his experience, which was colored variously by utter despair and unimaginable joy. He was treated as a spy, a god, a welcome stranger and a curiosity. The extraordinary trip became a journey into his own soul, and for many others – including the bikers Charley Boorman and Ewan McGregor – it is a pure inspiration. 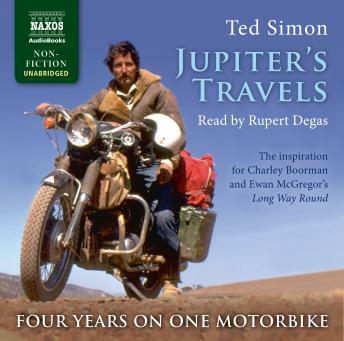 Rupert Degas, ‘the most versatile of narrators’ (The Times), captures all the thrills and spills of Simon’s experience and the timeless charm of his writing. This book was so compelling I could not wait to go for long walks to hear about the new adventures of this world traveler on his motorcycle!